My path to writing Saving Tarboo Creek was long and meandering. Some of the first tentative steps occurred in college, when I helped with some prairie restoration projects in Minnesota. I broke into a trot when I met Susan Leopold, during a summer when we both had fellowships to work at the Aldo Leopold Memorial Reserve in Wisconsin. The Reserve is the site of the Leopold Shack, where Aldo Leopold and his family made the first-ever attempt at ecological restoration. Leopold wrote a now-classic book, called A Sand County Almanac, to try and explain why they were spending all of their weekends doing the stoop labor required to restore native vegetation. Aldo is also Susan’s grandfather. She grew up planting trees with her dad; in that family, working on the land is just something you do. Though the path to this book slowed as Susan and I started careers and raised two young boys, we always dreamed of being able to do a restoration project as a family—so our boys would be the fourth generation of Leopolds to bring degraded land back to life. And now they are. We found Tarboo Creek in 2004 and got to work. In his essay “Why I Write,” George Orwell claimed that “Writing a book is a horrible, exhausting struggle, like a long bout of some painful illness.” During my 15 years as a textbook author, dragging two biology books through four editions each on that meandering path, I lived Orwell’s dictum. Please don’t make me go back there. But writing Saving Tarboo Creek was different. It was a joy—even though I wrote it with a slight sense of desperation. Orwell enumerates four reasons that writers write. The first is “Sheer egoism.” He means this in a positive way. Writers want to be read, to be paid attention to, to be movers and shakers, if only of very small things. And Orwell nailed me on this one. I wrote Saving Tarboo Creek because I thought I had something to say. Sheer egoism. 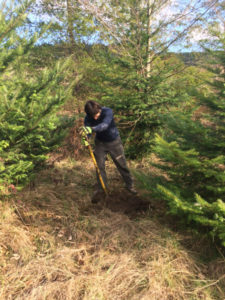 Part of the restoration process: Demetri preparing to plant a baby in among Douglas and Grade Firs we planted 13 years ago. During this year’s planting party #1, this month. His second reason? “Aesthetic enthusiasm.” Busted, again. There is nothing I love better than to write a sentence that sings a little bit. When I had a rough draft of the Tarboo Creek book done and sent it around to friends to read, one commented “I love your verbs!” in a margin. Another said she was dog-earing pages that had a sentence she wanted to re-read and savor. Comments like those are what convinced me to keep working and push the book to completion. It wasn’t unbridled aesthetic enthusiasm—I grew up in the Midwest and am averse to untoward displays of emotion—but bridled. Bridled aesthetic enthusiasm. Number 3 is “Historical impulse,” which Orwell defined as a “desire to see things as they are.” This was strong for me. We are living in the early stages of the sixth mass extinction in the history of life. We are obliterating or badly degrading just shy of an Oregon’s worth of tropical rainforest every year. My grandson may live to see average global temperatures increase by an additional 2-3ºC (3.5-5.5 ºF) and the human population more than double. And you think traffic is bad and housing is expensive now? The historical impulse is why I wrote with a slight sense of desperation. And finally, “Political purpose,” which Orwell defined as a “Desire to push the world in a certain direction, to alter other peoples’ idea of the kind of society that they should strive after.” Political purpose was the defining motivator of Orwell’s greatest work: Animal Farm, Nineteen Eighty-Four, Homage to Catalonia. He wrote to fight totalitarianism. His pen was a missile that exploded in people’s minds, inspiring them to resist, resist, resist. I, too, had a political purpose in writing Saving Tarboo Creek. On one level the book is about the work that my family and many friends and volunteers are doing to restore a degraded salmon stream in Washington state’s Olympic Peninsula. The first nine chapters each describe a step in the process—from bringing in an excavator to free the water from a ditch and direct it into newly sculpted, sinuous meanders, to ordering trees for reforesting the bank and adjoining uplands—along with relevant data on the state of the wider world, on the loss of salmon populations or rates of deforestation. Those chapters are descriptive. They are a narrative of how we act locally as we work on Tarboo Creek, but think globally. I didn’t write this book to be descriptive, though. Instead I wish to push the world in the direction of conserving resources, of treating land with the respect that good people accord each other. I wish to alter other people’s ideas of the kind of society that we should strive after, to one that is driven by the quality of our relationships with each other and the land around us, instead of by how much stuff we buy. This is what I call a natural life. It is characterized by an ecological state of mind; by a humble and interdependent point of view. In the last chapter of Saving Tarboo Creek, I write that there are four key elements to practicing a natural life. The first is engagement. A natural life is a life of action. We need to do things to connect with each other and the land. 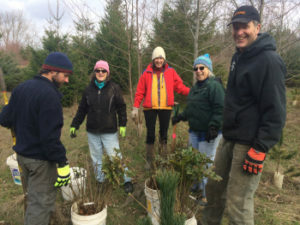 It might be gardening with family members, or fishing or hunting with a group of friends. 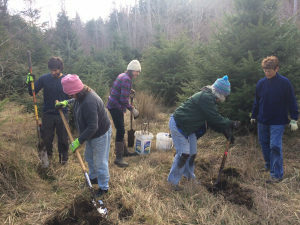 It might be planting trees with a bunch of grade school kids or recording blooming dates of wildflowers in the Cascades with other volunteers you just met. To live natural lives, we also need to be present. We need to put our phones down and talk to each other, to sit on a stump and wait for a deer to walk by instead of watching someone else’s video of it. Life needs to be listened to, seen, felt, tasted, smelled. For a few times a day at least, we need to breath a few times, slowly and deeply. We also need to be real—to cultivate a sense of self-worth instead of trying to buy one; to accept and love ourselves for who we are instead of trying to pose as someone else. This is the secret of life, after all: loving yourself, while simultaneously realizing that the self you love doesn’t matter. Other people matter. The land matters. And finally, a natural life is simple. It is not ascetic, and it is not austere. But it is simple. It prizes quality over quantity, a few good things over much mediocrity. It rejects the excesses of our culture and embraces values and practices that endure. At the end of Orwell’s essay, after defining his terms and enumerating his arguments, Orwell finally fesses up. Writers really write, he says, because they are “driven on by some demon whom one can neither resist nor understand.” Now we’ve gotten to the essence: writers write because they have to. Again I tip my hat to Orwell; again he has seen into my heart. I wrote Saving Tarboo Creek because I had to. I’m profoundly grateful that I lived long enough to write it. It is my gift to the world. I lay it at your feet.